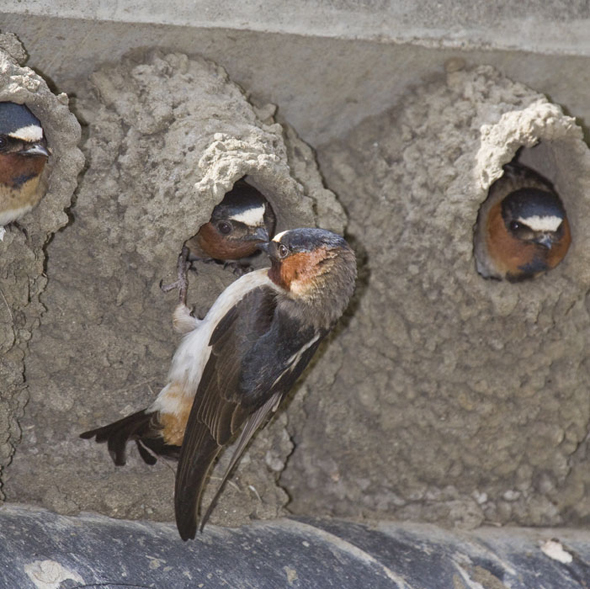 Cliff swallows (Petrochelidon pyrrhonata) in Cayucos, CA. Photo courtesy of Wikimedia Commons and Marlin Harms. Swallows evolve shorter wings to avoid cars, study suggests. Over the past few years, I’ve grown increasingly skeptical of such headlines. Still, sometimes the research really does live up to the media hype. This would seem to be the case here, in an NBC News story about the recently published work of Charles Brown and Mary Bomberger Brown. Collecting and studying the “salvageable specimens” of cliff swallows killed along the roads surrounding southwestern Nebraska’s Cedar Point Biological Station over the past 30 years, Brown and Brown found the numbers of road-killed birds “declined sharply.”  And the trend couldn’t be explained by the population of swallows living nearby (which increased over the study period), traffic volume (which “either did not change significantly or increased, depending on the metric used”), or the number of avian scavengers in the area (“as none showed significant increases in our study area”). Song Sparrow, Whitby, Ontario. Photo courtesy Wikimedia Commons and Mdf. New study attempts to demonstrate how the presence of predators alone can reduce songbird reproduction by bombarding birds with round-the-clock audio recordings of predator noises. 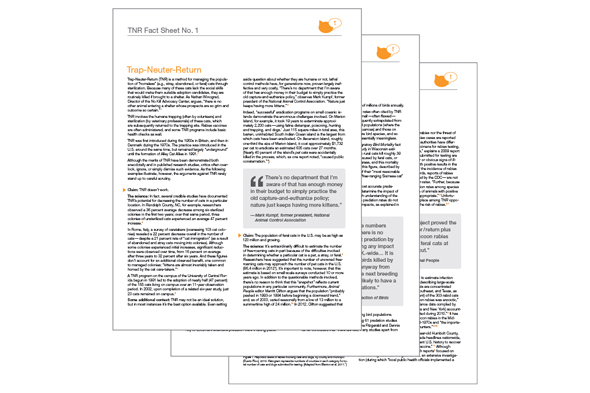 One co-author of the study goes further, attempting to implicate cats. The purpose of scientific inquiry (am I wrong about this?) is to reveal some truth about our world. Or the universe, in the case of astrophysics, say. Or, if we want to zoom out (and in, simultaneously) further still, the multiverse. Regardless of the particular phenomena under investigation, it’s essential that the methods employed replicate—to the extent possible—real-world conditions as closely as possible. Easier said than done—especially when the work is set in the messy, often uncooperative, real world, where researchers struggle to balance the desire for laboratory-like control (necessary for valid analysis) with the vérité-like need for authenticity (necessary for valid conclusions). Or not, as a study published last week in Science demonstrates. In fact, the songbirds in question were subject—Waco- or Guantánamo-style—to a round-the-clock barrage of menacing sounds over the entire four-month breeding season. Little wonder, then, their productivity was affected; what’s surprising is that these birds and their offspring survived at all (and didn’t decamp to quieter—even inviting (more on that shortly) terrain nearby). Perhaps Clinchy was expecting readers to overlook the bizarre methods he and his colleagues used. Or read their paper, “Perceived Predation Risk Reduces the Number of Offspring Songbirds Produce per Year” (PDF), in which there is no mention of cats at all. But for those of us who are paying attention, it’s clear: Clinchy is simply in no position to comment on the possible impact of cats—or, for that matter, any predator that doesn’t routinely participate, together with a host of other predators, both avian and mammalian, in a maniacal chorus incessantly tormenting the song sparrows breeding on British Columbia’s Gulf Islands (culminating, by the way, in no physical attack—which, no doubt, only further unsettles and disorients the targeted birds). To do so, the researchers exposed song sparrows on five of BC’s Gulf Islands to “playlists” of various “calls and sounds” either of predators known to frequent the area, or of the area’s non-predators. Among the predators were the common raven, northwestern crow, Cooper’s hawk, brown-headed cowbird, raccoon, and three species of owls. (The closest we get to a cat is a “brush disturbance sound.”) Non-predators included the Canada goose, mallard duck, northern flicker, Rufous hummingbird, belted kingfisher, downy woodpecker, common loon, harbor seal, and two species of frog (along with “surf sound,” a benign match to the aforementioned brush disturbance sound). Zanette and Clinchy have been studying the Gulf Island’s song sparrows for 12 years or more now, their work focused largely on the demographic impacts of predatory pressures and food supply (as well as the interaction of the two: “We conclude that annual reproductive success in song sparrows is a function of both food-restricted production and predator-induced loss and indirect food and predator effects on both clutch and brood loss.” ). Predation by cats plays only a minor role in their published work, yet both Zanette and Clinchy seem quite eager to talk up that role for more mainstream audiences. In an interview on CBC’s The Current about her participation in the documentary Cat Crazed, for example, Zanette describes research in which she and Clinchy used video cameras to “capture predators in the act of preying upon songbird nests” in Rithet’s Bog, 10–15 miles south the Gulf Islands. Although Zanette does acknowledge some other culprits—rats and brown-headed cowbirds, mostly—it’s with far less enthusiasm. Granted, the interview wasn’t about rats or cowbirds, but the context doesn’t explain the outsized impact Zanette ascribes the bog’s cats. And then there’s his comment last week about “this introduced predator.” All in all, it’s difficult to take these two seriously when they start talking about the impact of cats on the song sparrows they study. “Our results suggest that the perception of predation risk is itself powerful enough to affect wildlife population dynamics,” write Zanette et al., “and should thus be given greater consideration in vertebrate conservation and management.”  Even setting aside for the moment the unrealistic methods employed, the fact that these sparrows produced 40 percent fewer offspring doesn’t necessarily demonstrate population-level impacts; a single breeding season’s observations are hardly sufficient to make such projections. So, is the decline suggested by BBS data the result of song sparrows subject to the “calls and sounds” of cats (or any number of “brush disturbance sounds”)? I suspect it has much more to do with the calls and sounds of humans—whose numbers in the U.S. soared 55 percent, from 197 to 307 million, between 1966 and 2009. Yet, for all Zanette and Clinchy’s apparent concern for cats predating song sparrows, they never once cite Hawkins’ work. I’ve no doubt that this study was, as the researchers themselves describe it, “logistically very challenging.”  Managing the technology involved (which doesn’t always cooperate in the field) and the constant monitoring of nests and nestlings would, alone, keep a team of bright, ambitious researchers on their toes. But hard work, in and of itself, does not necessarily produce meaningful results. Australian National University biologists Tonya Haff and Robert Magrath, whose work is cited by Zanette et al., argue that nestlings are “finely tuned to their acoustic world, and responded appropriately to sounds of danger nearby.”  So why couldn’t adult birds pick up on cues—broadcast continuously every 96 hours—suggesting that (1) there is no danger, and (2) food supplies are plentiful? The predator-playback group, by contrast, would be picking up cues unlike anything they’d ever experienced: round-the-clock danger, in the air and on the ground. In the end, I’m left to wonder how studies such as this one—with its deeply flawed design—receive funding in the first place (in this case, by the Natural Sciences and Engineering Research Council of Canada and the Canada Foundation for Innovation and the Natural Sciences) and then warrant publication in Science (“the world’s leading outlet for scientific news, commentary, and cutting-edge research”). Instead of increasing our understanding of the world, this research only adds to our misunderstanding. I attempted to contact both Zanette and Clinchy by e-mail on Friday, but have yet to receive a reply (though there have been multiple visits to the Vox Felina site from in and around London, Ontario, where Zanette is based). Zanette never replied to my previous inquiry, either, related to her comments in the CBC interview. 3. Zanette, L., Clinchy, M., and Smith, J.N.M., “Combined food and predator effects on songbird nest survival and annual reproductive success: results from a bi-factorial experiment.” Oecologia. 2006. 147: p. 632–640. 4. Hawkins, C.C., Impact of a subsidized exotic predator on native biota: Effect of house cats (Felis catus) on California birds and rodents. 1998, Texas A&M University. 6. 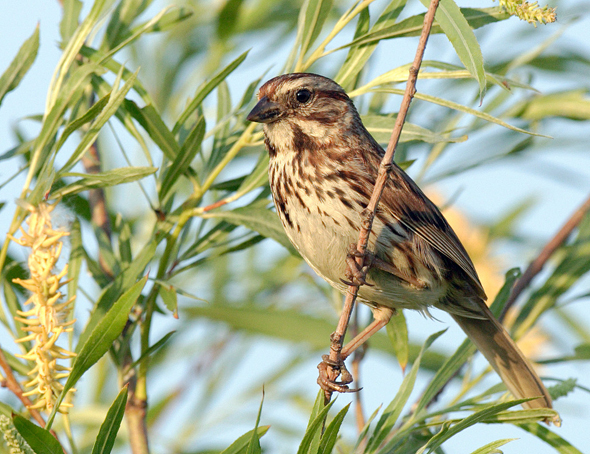 Zanette, L., et al., “Synergistic effects of food and predators on annual reproductive success in song sparrows.” Proceedings of The Royal Society B. 2003. 270: p. 799–803.